Popspoken was lucky enough to snag a seat at the bustling Dazzling Cafe located in the recently-renovated Capitol Piazza. Hailing from Taiwan and influenced by a French aesthetic, Dazzling Cafe greeted me with pleasant pastel blues and white as I made my way to the table. The food however, was the biggest treat. 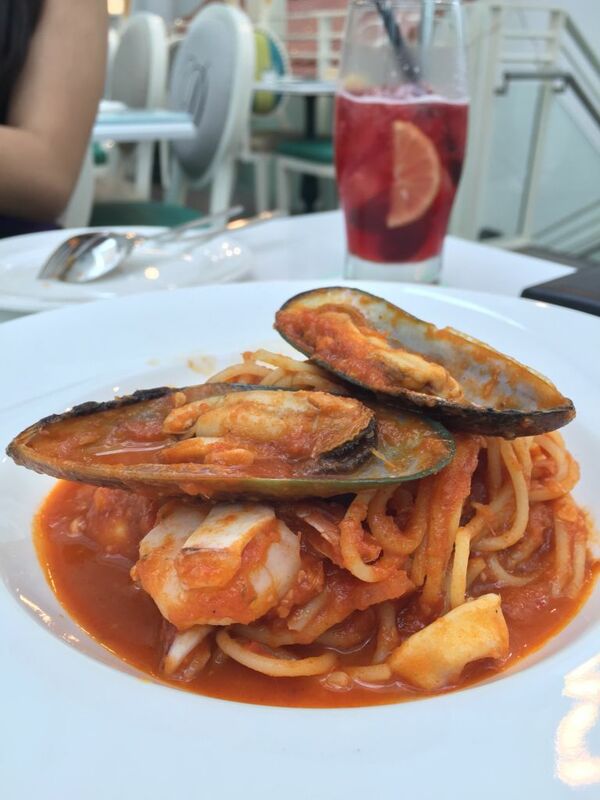 The first main dish I tried was the Spicy Seafood Tomyam Tomato Spaghetti ($22.90). Now I’ve learned to stay away from Tomyam-flavoured pastas in Singapore after countless times of being disappointed, but at Dazzling Cafe, I decided to give it a chance and was pleasantly surprised. Usually, the tom yam flavour in similar pastas can be extremely overpowering. In this case, there was a good balance between the tomato and tom yam flavours and the tom yam was added tastefully. The seafood itself was a decent portion and the entire dish is enough to satisfy one hungry diner. 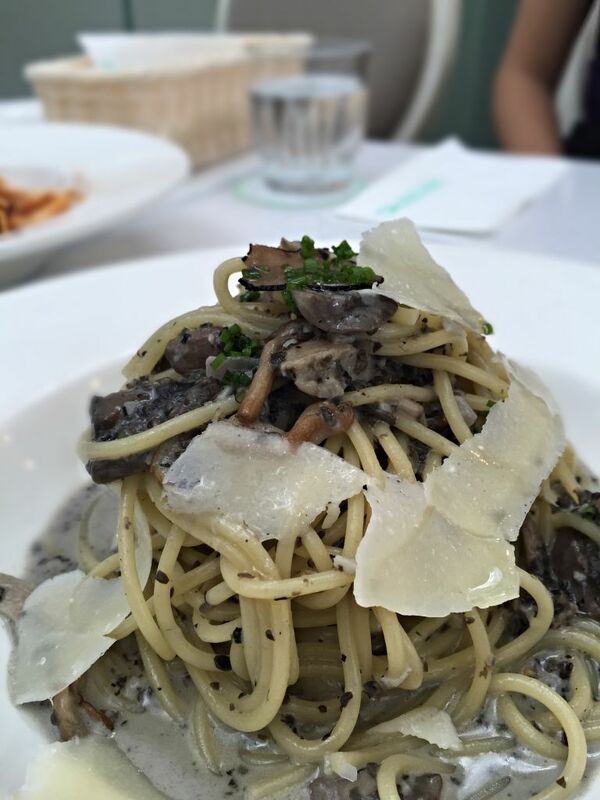 If you’re someone who doesn’t like such strong seafood flavours and would like something more subtle, opt for the Black Truffle and Wild Mushroom Spaghetti (above, $24.90). It’s the priciest food item on the menu so you might have to be willing to splurge a little. That being said, this dish will not disappoint. Restaurants can sometimes be really stingy with their portions of truffle oil but Dazzling Cafe makes sure that every morsel of pasta you eat will be coated in their fragrant truffle cream sauce. The dish can feel slightly “heavy” after a while, but the chefs’ addition of the wild mushrooms help to add a different texture and depth of flavour to the dish. The restaurant is known to have some of the most photo-friendly desserts and I can assure you that the desserts are even more impressive in person! Each dessert is large enough to share amongst 2-3 hungry people. 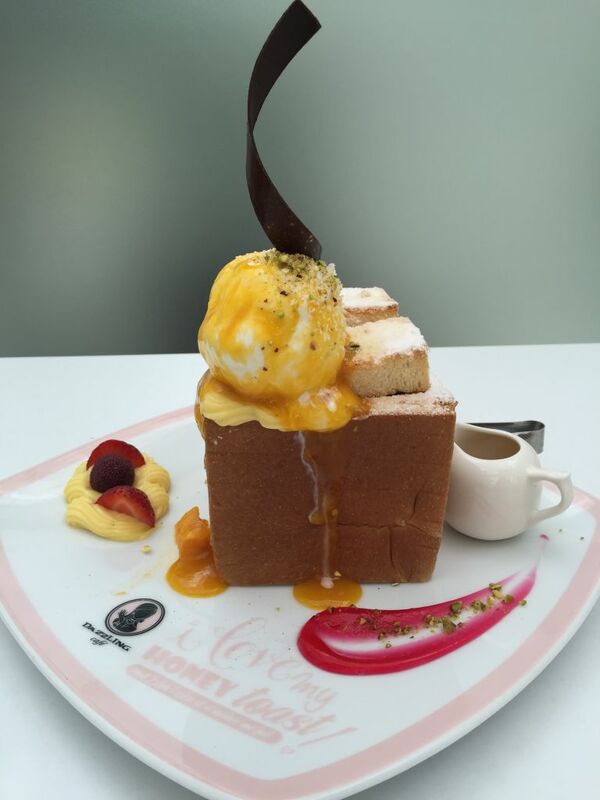 I was lucky enough to try two of their popular honey toasts – Hazelnut Chocolate Honey Toast (above, $19.90) and the Mango and Coconut Gelato Honey Toast (below, $18.90). At its price, I think the Mango and Coconut dessert, which is a Singapore exclusive, has greater value. Although the toast for the Hazelnut dessert was crisp and had chocolate filling in it, the Mango and Coconut dessert is much more unique and refreshing. A plus point is that both desserts were topped with ice cream from Haagen-Daaz which made them taste even more luxurious than they already looked. Some students might rate Dazzling Cafe as a little on the pricier side, but if you come with a group of friends, the prices are much more manageable. 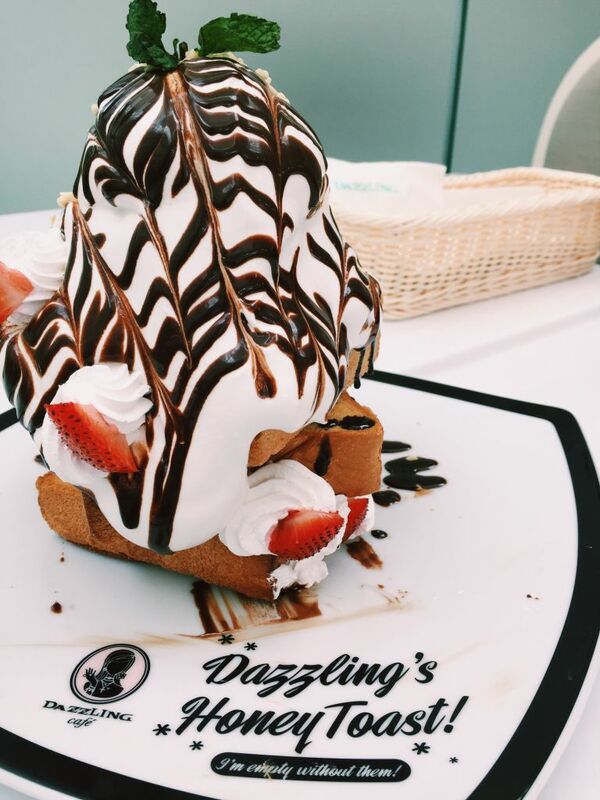 With its beautiful plating and camera-ready offerings, Dazzling Cafe is definitely worth it. It may just be what your Instagram grid needs!